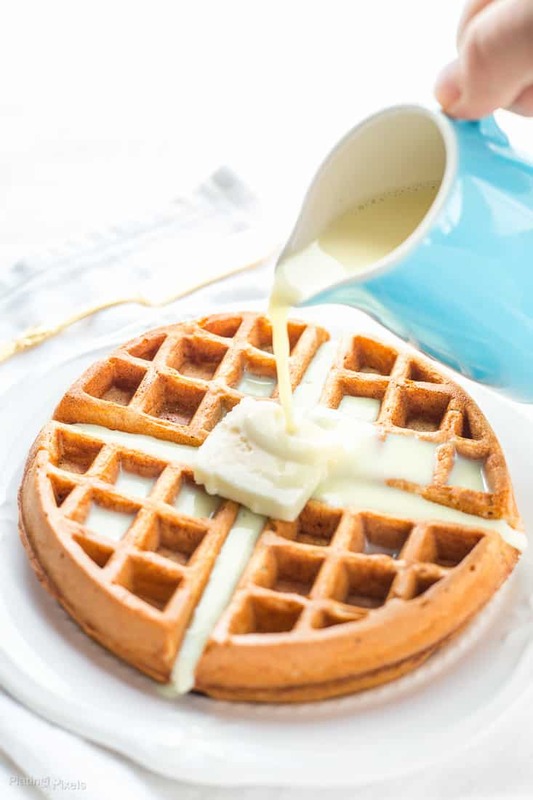 With this Easy gluten free Eggnog Waffles recipe you’ll learn a hack to have eggnog in (and on) your waffles, it’s pretty simple. 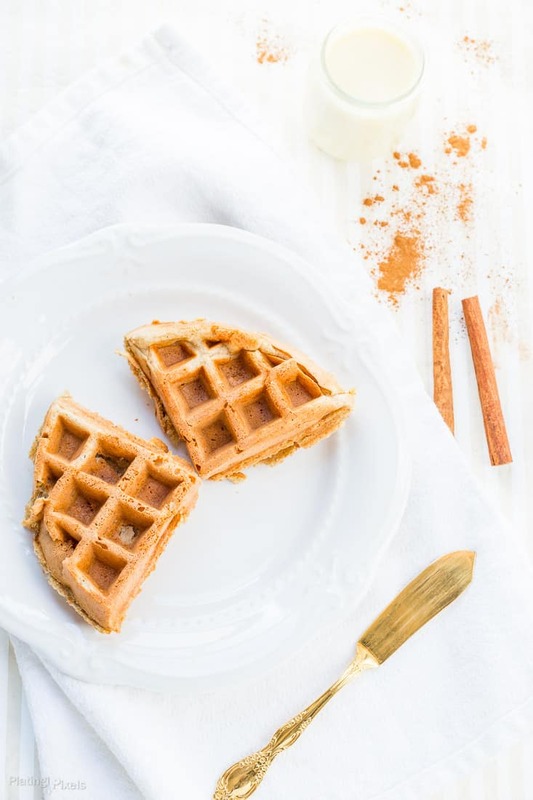 Holiday themed gluten-free waffles with oat flour, eggnog, nutmeg, cinnamon and banana make a decadent healthy breakfast treat. I love the holidays and the fun foods that go along with it. Some of my winter favorite flavors are hot chocolate, peppermint, cranberry, rosemary, and of course eggnog. My mother would often make her own eggnog from scratch, but store-bought works perfectly fine for this recipe. 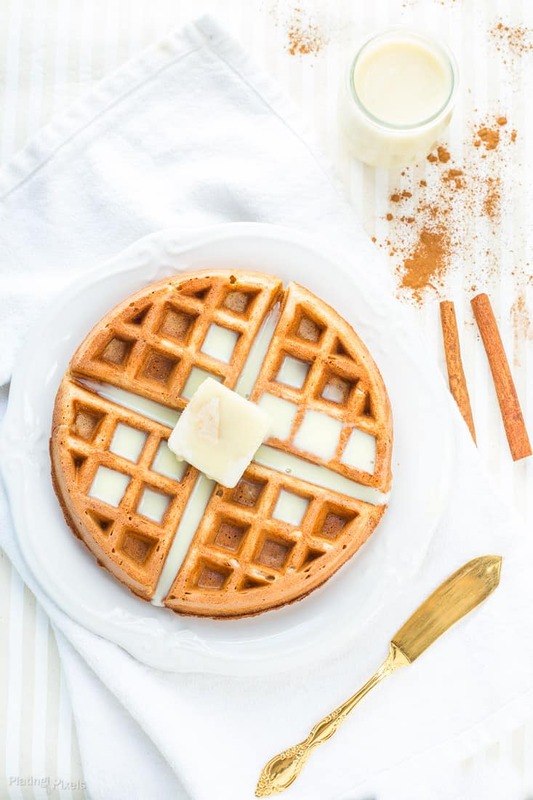 What makes the holiday even more fun is recipe hacks like these healthy and gluten-free Eggnog Waffles. Eggnog isn’t just for drinking and dessert anymore. 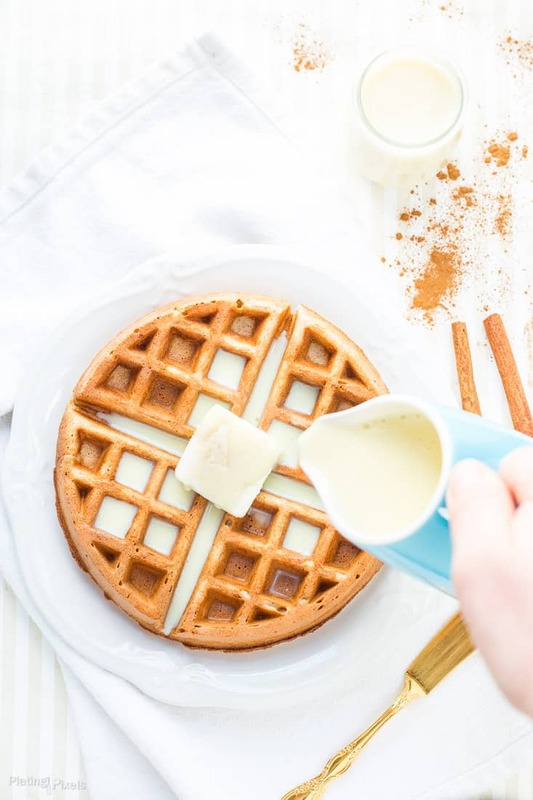 Breakfast is a perfect time to enjoy eggnog now thanks to these waffles. The eggnog is cooked right into them instead of milk, with added holiday spices of nutmeg and cinnamon. Let the batter rest for 10 minutes before cooking. This helps the oat flour soak up the mixture making them soft and fluffy. Eggnog: These wouldn’t be eggnog waffles without it. Adds important moisture and lots of flavor. Eggs: Helps with waffle consistency and adds protein. Can you freeze waffles for leftovers? Yes! The great thing about waffles is that they freeze really well. You can make a big batch of these then store them in the freezer. Bring one or two out when you need them and you’ve got yourself a delicious, festive and super quick breakfast for weekdays! Crisp them up in a hot oven for a couple of minutes and they’re ready, there’s no need to thaw them first. These contain no butter or added sugar, and are naturally sweet and healthy waffles. To top it all of, instead of syrup go ahead and drizzle with more eggnog. Go ahead and try it, you’ll thank me later. Flavor profiles: Eggnog! (that’s a flavor profile right?). Holiday spices like nutmeg and cinnamon, with slightly sweet and savory waffles. Texture: Fluffy, moist eggnog waffles with just a bit of crunch. Thick and creamy eggnog as topping. Easy gluten-free holiday breakfast treat. Eggnog in your waffles! In separate medium bowl, whisk the eggs. Add eggnog, olive oil, banana, maple syrup and vanilla extract. Whisk until completely combined. Pour into flour mixture. Stir with spatula or spoon until just combined. 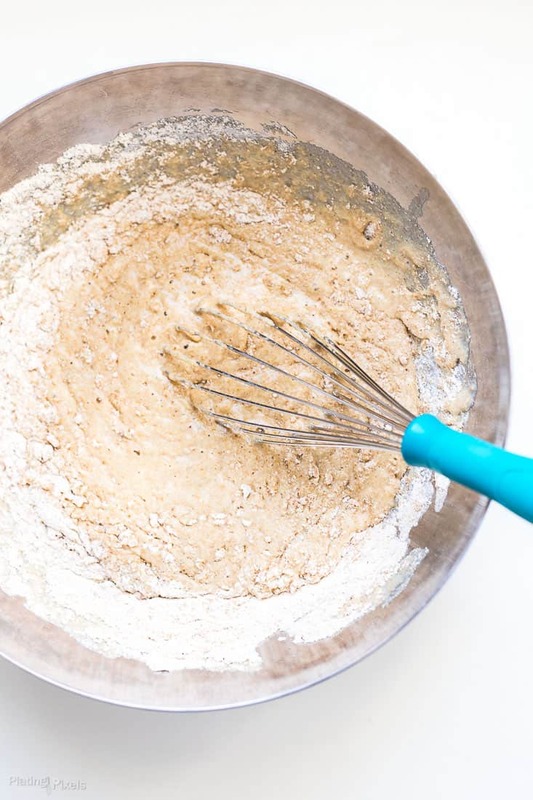 Let the batter sit for 10 minutes for oat flour to soak up moisture. Plug in and preheat your waffle iron. Gently stir the batter one more time to combine. Pour desired amount of batter (mine iron is ½-cup) into center of heated waffle iron. Cook each waffle according to waffle iron directions (usually 3-5 minutes), until crisp and golden brown. Serve right away or place waffles in oven at 200º F. to keep warm and crisp until serving. Spread with butter if desired and pour additional eggnog over as a syrup. I’m so happy that it’s eggnog season. These waffles look amazing. I need to try this recipe! I always make waffles on New Year’s Day for breakfast. Definitely plan on trying these! My husband loves eggnog, I’ll be making these for him this holiday season! Nothing like homemade waffles so fluffy and good and then with eggnog, yummy! 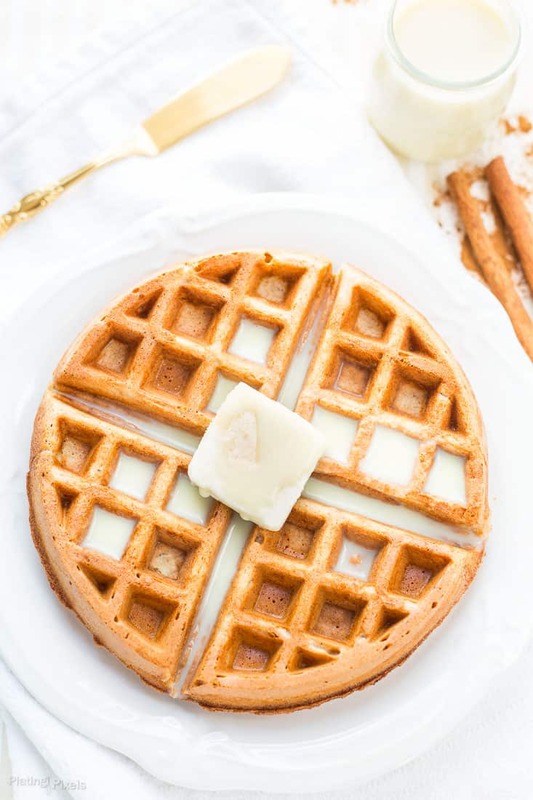 Eggnog waffles sounds like a scrumptious idea! This would be such a great breakfast treat! Oh yum what a great idea! Lovely photos! It’s mainly adds nice holiday spice and helps with texture. I’m pretty sure you’ll love these. Thanks Ashley! I have never had eggnog but these look truly delightful, so golden! Seems like a good time to start 😉 Thanks Carmella! Wow, these waffles look amazing! Perfect for laid back mornings during holiday break! They totally are. Thanks Emily! Perfect!!! I will be trying these this weekend! I am pinning these! Oh my. I need to make these for my gluten-free husband. He loves waffles AND eggnog. Perfect! This waffle recipe looks fantastic! I love the idea of using eggnog! Thank you for sharing!! Thanks Ashleigh! It’s not just for drinking anymore. Of course you can serve it on the side with these still. I’m posting a peppermint dessert next week. Bet they’d be amazing together as a warm drink. Thanks Joanna! Love the sound of this recipe! I’m trying to cut the gluten a bit from our diet so these waffles will be the perfect weekend breakfast! Thanks! They sure would be! Thanks Mary and have a wonderful weekend! Firstly, your pictures are gorgeous. Secondly, YUM. Definitely trying this! That means so much and thanks Chelsea! I’ve been working on improving my food photography and appreciate the feedback. Aw thanks Kelsey *blushing*. I guarantee you’ll both like this. Thanks for the nice comment! Dang it, Matthew! I guess I’ll have to add waffle maker to my Xmas list. Love eggnog and these waffles! Awesome pics, too! Haha sorry and you’re welcome. I got mine as a gift and love it. Be sure to get the thick Belgian-style one. Thanks Raquel! These look absolutely delish! Fabulous photos as well! Eggnog sure does waffle. Thanks Christine! 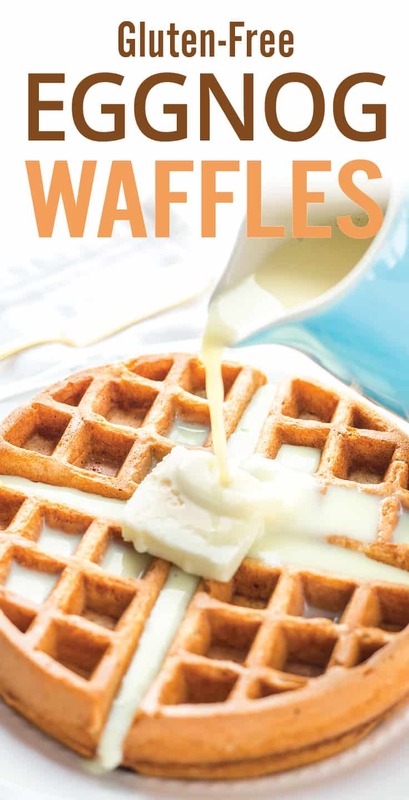 My husband just went gluten-free and we used to love waffles, I will have to try making these once I find oat flour! Well that’s perfect and glad he found a new waffle recipe! I think most grocery stores have it now-a-days, otherwise a healthy market would. Thanks Hil!